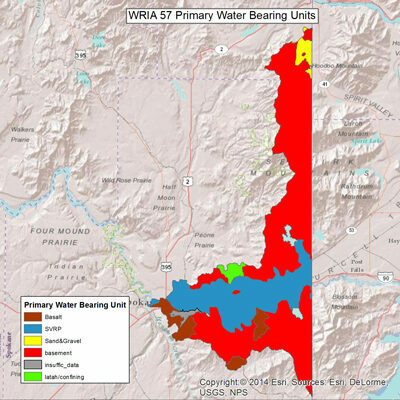 This map presents the primary water bearing units within the Spokane River Watersheds. The primary water bearing units are the geologic units from which most water supply wells within an area derive water. This map is intended as a general guide and should not be used on a site specific basis. Hydrogeologic systems are complex and can vary considerably in relatively short distances. This map was developed from well logs found in the Washington Department of Ecology Well Log Database, surficial geology maps, and the following regional hydrogeologic studies. Kahle, S.C., Taylor, W.A., Lin, Sonja, Sumioka, S.S., and Olsen, T.D., 2010, Hydrogeologic framework, groundwater and surface-water systems, land use pumpage, and water budget of the Chamokane Creek basin, Stevens County, Washington: U.S. Geological Survey Scientific Investigations Report 2010-5165, 60 p.
Kahle, S.C., and Bartolino, J.R., 2007, Hydrogeologic framework and ground-water budget of the Spokane Valley-Rathdrum Prairie aquifer, Spokane County, Washington, and Bonner and Kootenai Counties, Idaho: U.S. Geological Survey Scientific Investigations Report 2007-5041, 48 p., 2 pls. Spokane County Water Resources, 2013, West Plains Groundwater Elevation Monitoring and Mapping, 60 p.
Northwest Land & Water Inc., 2010, Hangman Creek Watershed (WRIA 56) Hydrogeologic Characterization & Monitoring Well Drilling Phase I & II Report, variously paginated. McCollum, L.B., McCollum, M.B., Hamilton, M.M., and Pritchard, C.J., 2013, Mesoproterozoic and Cambrian Geology of the Northeastern Columbia Plateau of Washington-A View from the Steptoes.